Apparently, I didn’t get my fill of building up little Christmas trees— and felt the need to go big! Actually, a project I took on last week was out of pure necessity. 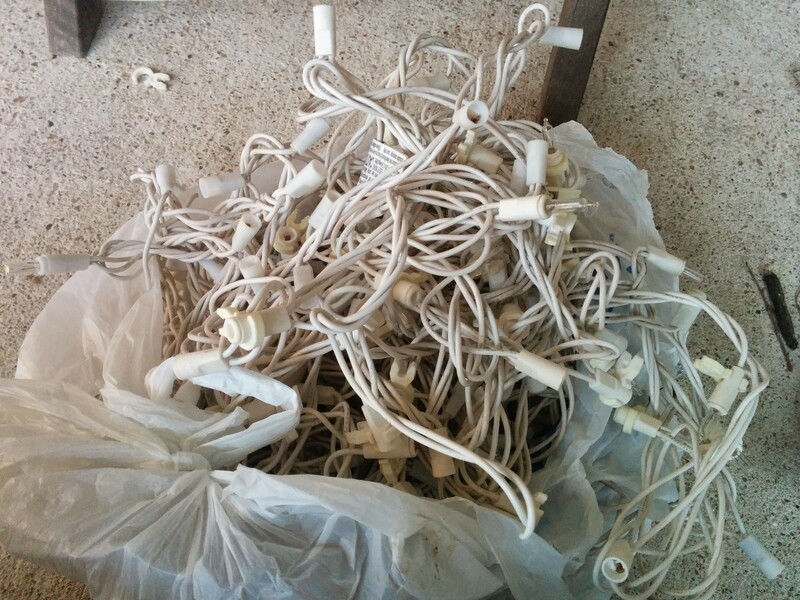 The inevitable Ghost of Christmas Past that randomly appears in all homes as the boxes come out of attic: Dead Christmas Lights!!! 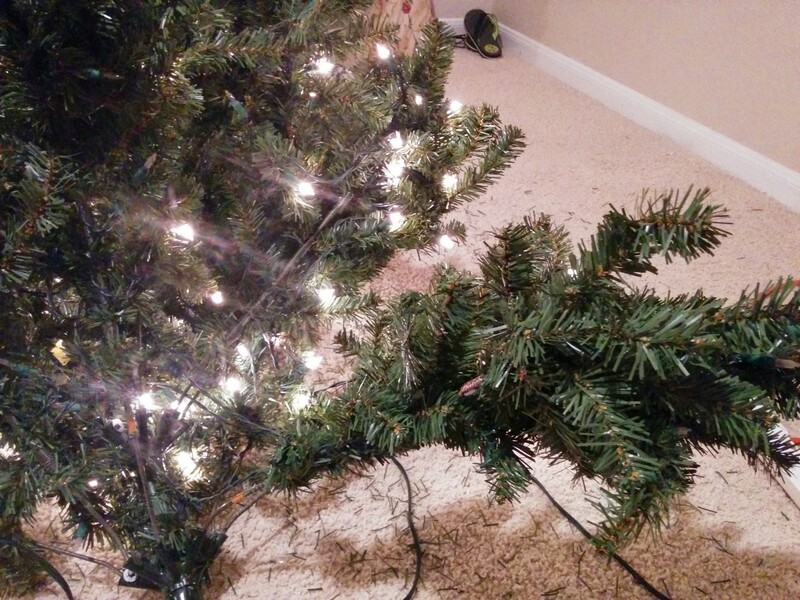 Our pre-lit Christmas tree had slowly degraded after cooking through several Texas summers in our attic. The tree sheds more needles than a real tree and has definitely lost it’s luster. 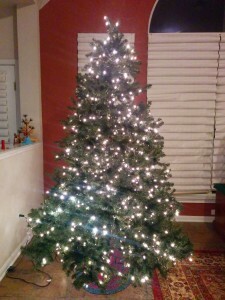 The tree comes apart in 3 sections and has 9 strands of lights (50 each). I decided I would try to revive the tree with a cool gadget I spotted at Target, the LightKeeper Pro, that advertises itself as “A Cool Yule Tool”. Hereafter, I will refer to it as my LightSaver Phaser. Or LSP. It has several cool features to it, including a light tester, a fuse tester, a light puller, an inductive loop to detect current in a live wire, and a way to ‘zap’ a strand of lights either via an empty light socket or by plugging it directly into the plug on the end of the strand. Oh, and the handle serves as a storage compartments for extra bulbs and fuses. As they say, YMMV (Your Mileage May Vary) and mine certainly did. Of all the features I found the least useful to be the current detector. 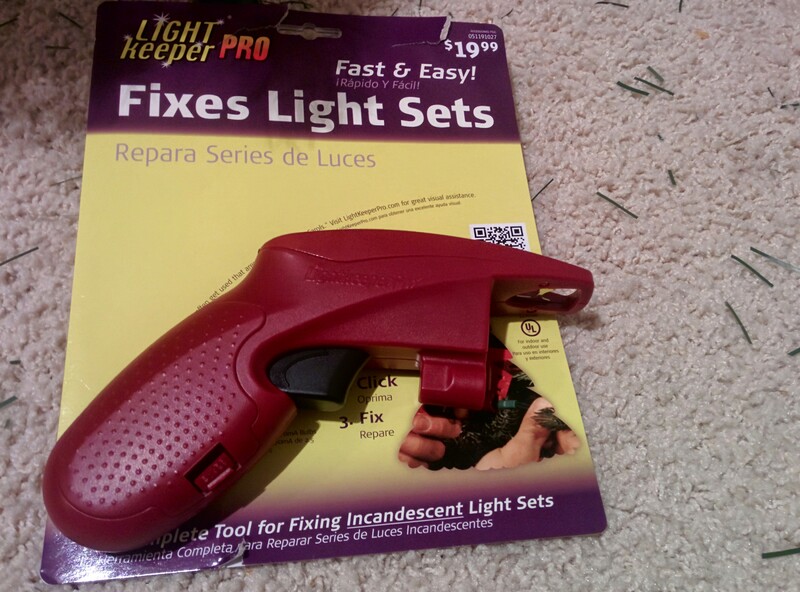 Maybe it would work great in a standalone string of lights, but with lights on a large tree, with multiple circuit paths and an aluminum frame, I found that the current detector was very unreliable. But before we get to that, let’s do a quick overview of what exactly we mean by ‘fixing’ Christmas lights. Per usual when going to fix something I knew some stuff, but some stuff I had to learn. 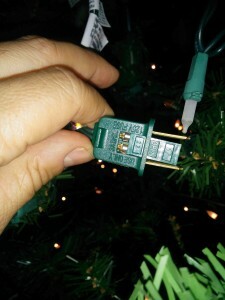 Of course we all know that mini incandescent Christmas lights are generally connected up in series. But have you ever wondered why when one light goes out the entire string doesn’t go out? If they are in series shouldn’t the entire strand go out? 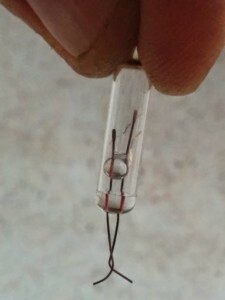 The shunt is of higher resistance than the filament, so when the filament is intact, the current goes through it and lights the light. 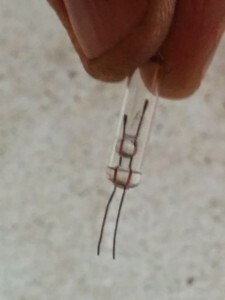 When the filament breaks, the current is forced to through the shunt, which is made of a material that will reduce its resistance after a large amount of current goes through it. So even a “dead” bulb helps to keep his brethren “alive”! So why the glum tree? The fuse for that strand is burned out! All the lights in that strand are all burned out! One or more lights in the strand has burned out but the shunt is still highly resistive. One or more lights in the strand has come loose out of its socket not allowing current to conduct (or similar where the legs on a bulb just break). Well let’s just say that on this tree I encountered all scenarios except for the first one. Basically, fixing lights means either replacing fuses, replacing bulbs, reseating bulbs, and/or forcing shunts to do their job properly. A quick warning: This sort of debug is very tedious! But if you’re willing to spend a little time and effort, it can be very rewarding, saving you some $$ that could be spent on other things at Christmas!! First thing you will need is some spare working lights. 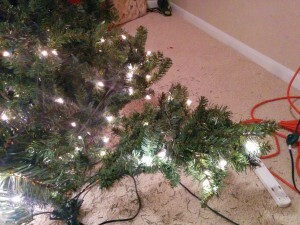 The extras that come with a set of lights are generally not enough to repair a completely broken strand on a prelit Christmas tree. 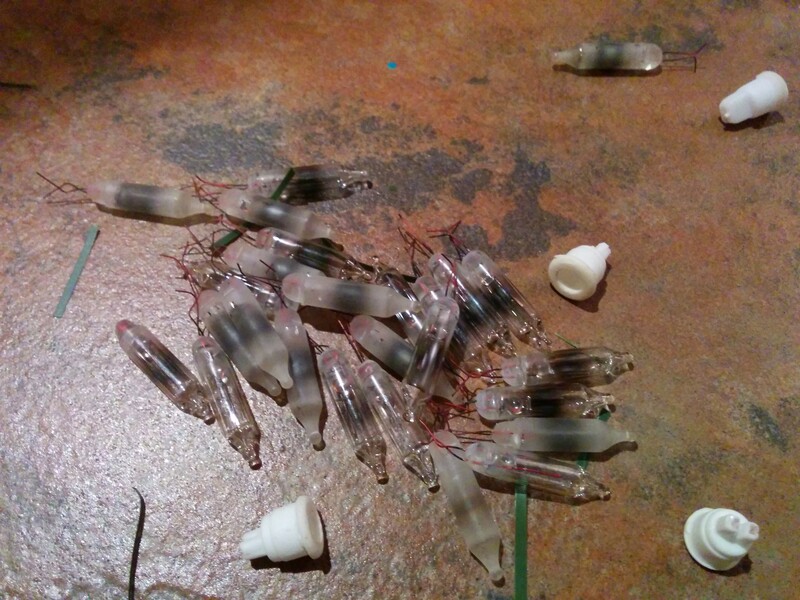 Fortunately, I had a spare old strand of lights that I use to scavenge working bulbs. Go ahead and test the fuses in your handy-dandy fuse tester in your LSP. If any of the lights along that strand are working then it’s definitely not the fuse. Like I said, for me the fuses were never the source of the problem. Pull the trigger like 20-40 times then check again if any lights recovered. For me this worked to recover some of the lights! 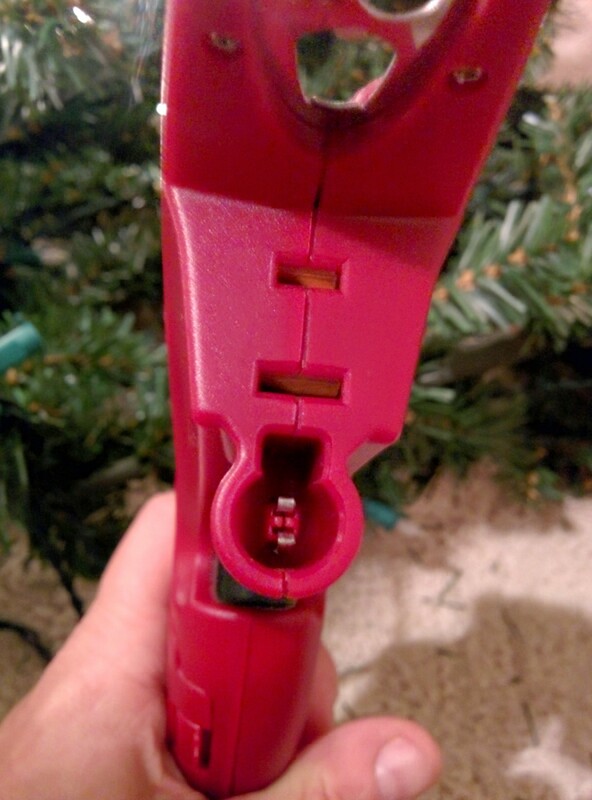 First of all there SHOULD BE NO empty sockets on your tree! Empty sockets cannot conduct current no matter what so be sure you don’t have any! Again, click the trigger like 20-40 times. TIP: When pulling lights out on a big Christmas tree it can be really easy to forget where you left that empty socket on the tree which can waste valuable debugging time. 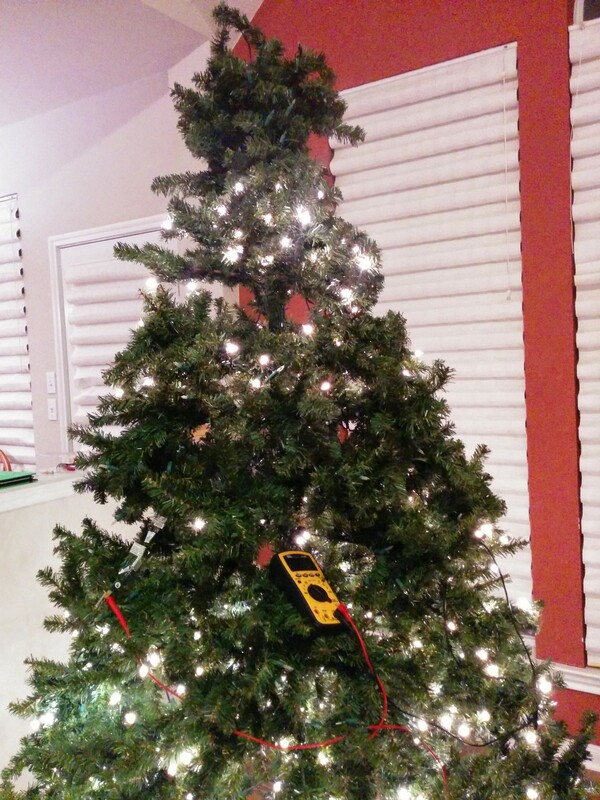 Get an ornament or ribbon to remind yourself where you left those pesky empty sockets! 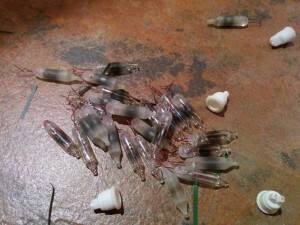 Replace as many of these bad bulbs as you can! 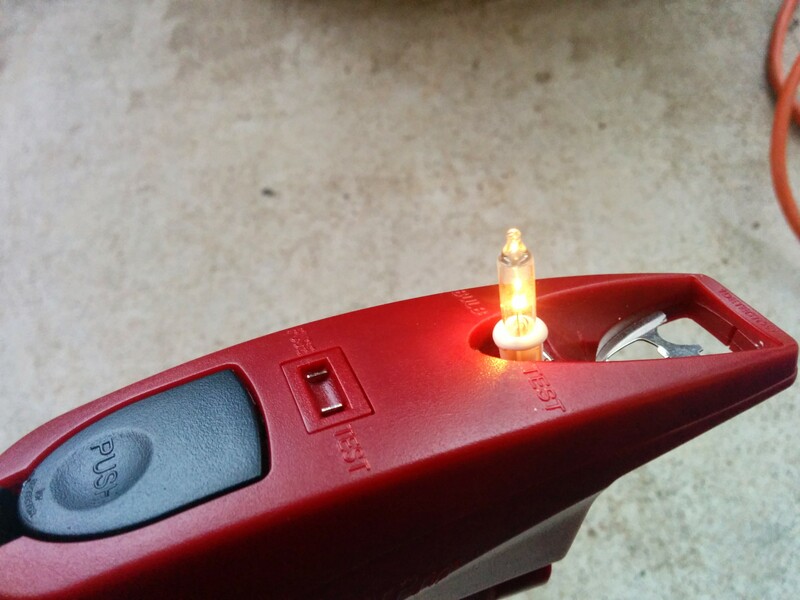 Test them in the light tester in the LSP after removing them to confirm that they’re dead. 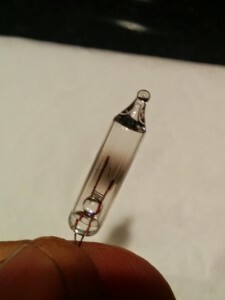 To replace, you’ll need to keep the plastic plug at the base of the bulb and only replace the glass bulb itself as typically the plug and socket have a very tight fit and need to stay together. 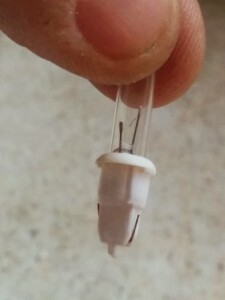 Finally, test out your new light bulb and plug to be sure it works before replacing into the light socket. 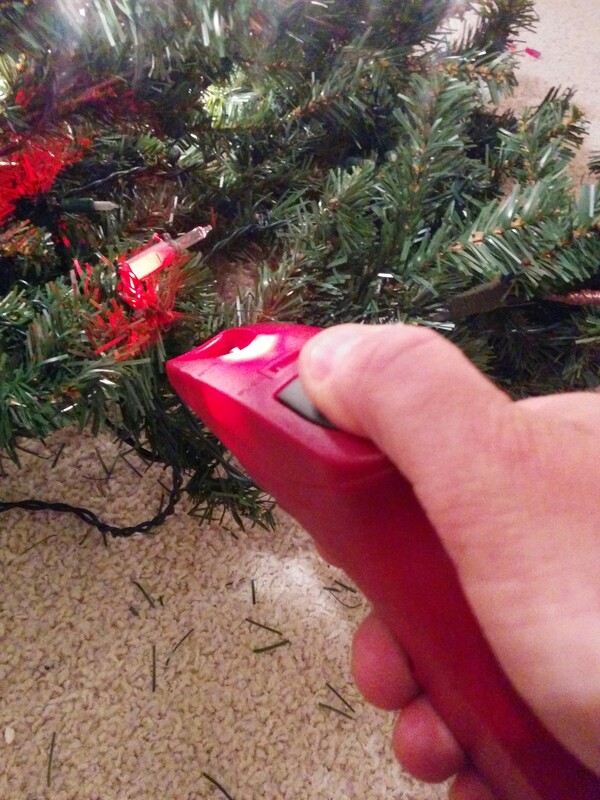 Fair warning: I had to do this at least 50 times for the strand at the very top of the tree, that appeared to have been completely shorted out! Ok, at this point if you still have lights that appear to be out, especially in large groups and there don’t appear to be any “burned out” bulbs, then we probably have a bad shunt or a bad connection in a socket somewhere. Finding the culprit bulb after attempting all the above will be tricky and require you to be methodical to keep your sanity. 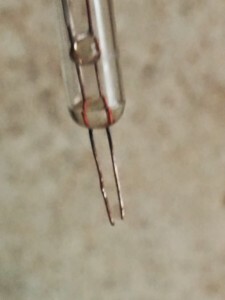 It lights up a red LED but that has nothing to do with whether current is detected. It’s only there to help you aim the LSP. The beeping (many beeps in a row) are the indicator. You’re supposed to go from one light to the next while the device is beeping until the beeping stops. 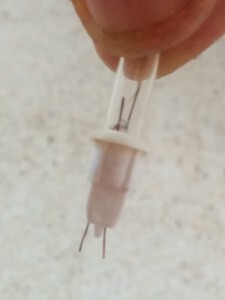 The socket at which the beeping stopped (or the one before it) is the culprit bulb. If when you put the empty socket onto the LSP, you notice some lights start to come back to life elsewhere on the strand, congratulations! You found a bad bulb with a bad shunt! 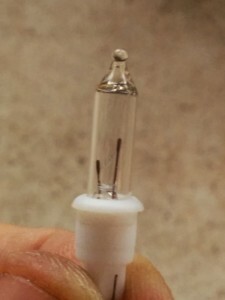 However, if when you pull the bulb out BUT BEFORE you put the LSP on it you notice lights GO OUT, bad news, the light bulb you chose, although not working as a light, still has a working shunt! It’s not the culprit bulb! Like I said before, take the ‘current detector’ with a grain of salt. 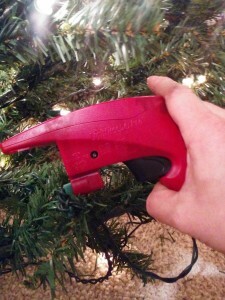 The instructions say to not touch the tree or wiring while doing current detection. Also it’s possible that the frame of the tree can interfere with the inductive coupling necessary for the detection to even work. So you might sometimes just have to guess. Take heart, young debugger. You will soon find the culprit bulbs! Eventually, in one particular area I had to resort to marking all “good” bulbs with a permanent marker on the socket so I didn’t go back and suspect bulbs I had already tested! After a bit of painstaking work, finally found the 2 remaining culprit bulbs and the Ghosts of Christmas Past (as least for now) were banished! I truly wish you well on your debugging quest. Please comment if you attempt this little adventure! After Christmas though, I’ll probably be looking for a new tree– one with LEDs! !